The franchise that is now called the Washington Nationals have called more NATIONS their home than have had pitchers clinch a post season series. In 1969 they were formed as the Montreal Expos, being the first team to play in Canada. In 2005 they played their first game in the District of Columbia as the Nationals. And in their 43 seasons they have made the post season once. In the strike interrupted 1981 season, they were the second half champs and played the first half champs, the Phillies. Now the Cardinals actually won more games than the Expos or Phillies did over all, but in '81 they split the champions up and St. Louis, second place in the first and second half, were out of luck. One strike helped the Expos. Another tooketh away. The 1994 Expos were one of the most talented teams of the decade, but were denied a shot at the playoffs because of the season ending strike. So the team only played in October in 1981. They won the series against the Phillies but Rick Monday and the Dodgers broke their hearts and no World Series was ever played in Quebec. As I wrote before, no Washington pitcher ever clinched a post season series. The Senators lone championship was won on a walk off single by Earl McNeely. So this is it... the only post season series clinched by a Montreal or Washington pitcher. LAST OUT: Manny Trillo lined out to first baseman Warren Cromartie. No doubt eventually a Washington pitcher will eventually clinch a series. It could be Stephen Strasburg. It could be someone we're not thinking about. But it is a safe bet as well that big league baseball won't return to Montreal any time soon. So Rogers eliminating the defending champion Phillies will remain that team's greatest moment. The Expos had a wonderful team for a while. They were worth a salute. Watch this video and say Au Revoir. 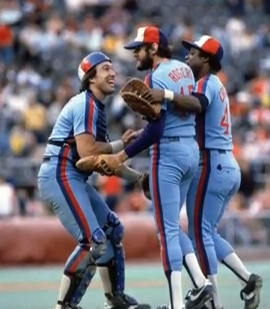 The Expos were a wonderful team and they deserved a lot better than their eventual outcome. I am from Montreal and followed them very closely until their demise. It was a sad day for me and many, many others. haha I gotta love that post of yours and especially the photos you added, you have a talent for that, has anyone told you that? ?